I’m usually not a big fan of wind (no pun intended) but since today’s winds were westerly with a slight southerly component, I figured that some birds could be moving, so I headed to the best wind block and my favorite lakewatch spot in northern Lake County, North Point Marina Yacht Club. Andy Stewart and Steve Mulhall had already been ticking off species for about 30 minutes before I got there due to my forgetting about DS time, so I had some catching up to do. Usually west winds aren’t the greatest for a lakewatch in Lake County, or anywhere on the west side of the big lake, but we had a unique geologic/weather/structural phenomena to help us out this morning. 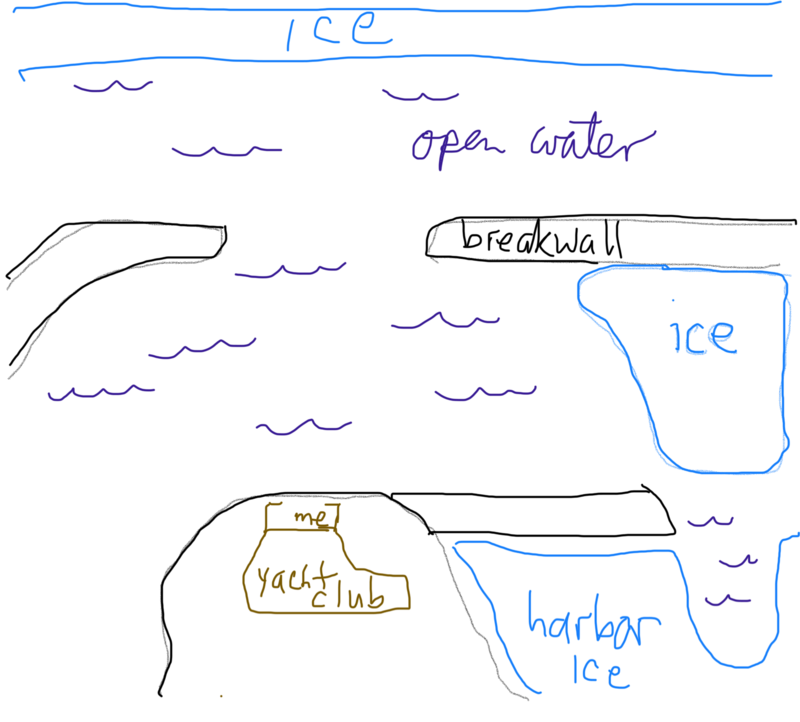 Since the birds prefer open water in case they want to rest and get some food, they don’t fly as much over the pack ice. The pack ice had been blown out into the lack by the strong westerly winds, so that created a little channel that many of the ducks were flying through and were thus much closer than they usually would be with this direction of wind. See aerial view diagram below. 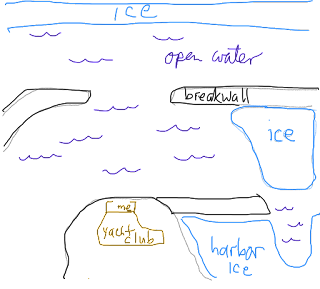 The birds were flying between the ice at the top and the breakwall for those not familiar with the yacht club. I was there with Steve and Andy, and later Gustavo Ustariz, for 2 hours. For at least 90 minutes the LONG-TAILED DUCKS were streaming by as either individuals or groups of 2-15 every few minutes, and many of them landed in the water. I put down 56 on ebird but this was a very conservative count of birds that I didn't see land since I didn't want to double count. There were probably over 100. This is the only time I can remember ever doing a lakewatch and having ANY bird outnumber RED-BREASTED MERGANSERS as flybys. It didn't happen today either, but it was pretty close. I definitely have never seen this many LTDU (LONG-TAILED DUCKS) in my life. It was especially cool because most of them were close by and, even though the looks were fleeting, we had nice views of the white heads and long tails of many males...something else you don't often see. So the LTDU flight was pretty epic, but even more so to me anyway, was the RED-THROATED LOON that flew right into my scope view as I was scanning the lake. I have been looking for that bird all winter, but like many birds this winter (most notably Northern Shrike and Short-eared Owl), they just haven't been around here in Lake County, so that was another highlight of the morning. The last highlight were the puddle ducks. We had a NORTHERN SHOVELER, 5 AMERICAN WIGEON, AMERICAN BLACK DUCK, and I had 12 NORTHERN PINTAIL, though the others had more I believe. Also a flyby GREAT BLACK-BACKED GULL and a calling KILLDEER ( no shorebird shutout!) made our lakewatch pretty successful. All in all a pretty great morning. Bring on Spring! My wife told me this past spring that she and my daughter would be taking a girls' weekend at the beginning of June. My initial thoughts of "Wow. Sounds fun....except I will miss you guys" quickly switched over to "Wow. Sounds fun, and I WILL miss you guys, BUT what a great chance to take a June Southern IL birding trip!" In all fairness, my in-laws live in Collinsville, so we make a trip down there at some point almost every summer. I spend most of my time down there looking for birds, mostly in the Collinsville area, but I make a few trips farther south as well. In any case, I have never done just a birding trip at the peak of the breeding season down there, so I was excited about that prospect. 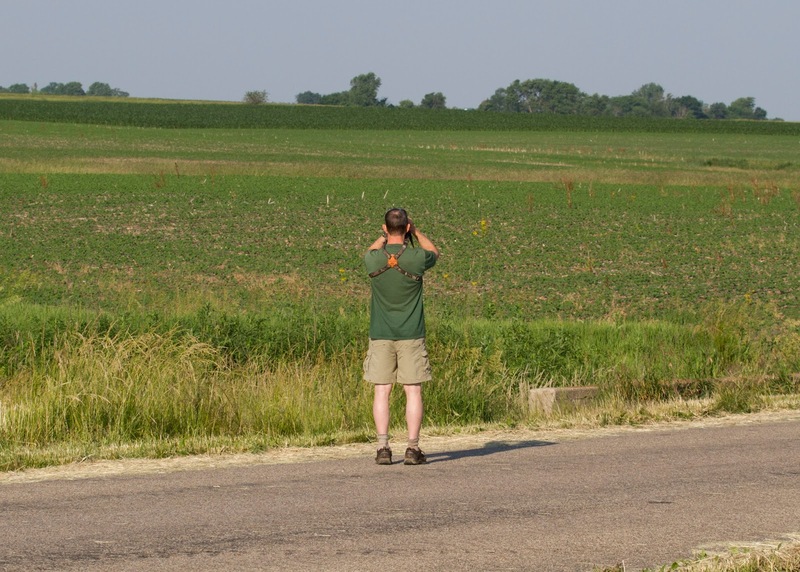 Plus, birding in S. IL is such a completely different experience than birding Lake County. I was juiced to go find some cool stuff. I was initially planning on a solo trip because I really didn't think anyone would want to be trapped in a car with me for 3 days, but Nat Carmichael stepped up and said he was ready for an adventure. Thus began our Southern Illinois Experience. Yes, we are definitely birding geeks. One piece of advice, though. Don't park next to any RV's or leave space for them to park near YOU. We made the latter mistake and had an RV air conditioner blaring in my ear for the entire night. Not good. Otherwise, the experience was top-notch, though. The itinerary for the weekend was basically to start early Fri morning and drive to Hennepin for first light, then head to all the spots at Emiquon/Lake Chautauqua, finish the day looking for anything at Lake Springfield then do a Southern Illinois Big Day on Saturday. Sunday.....breathe.....and drive home. 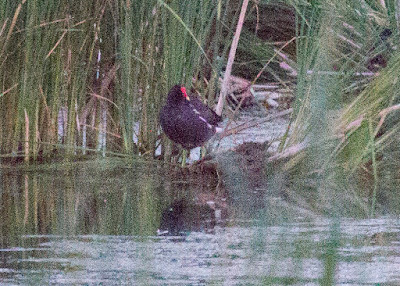 Hennepin gave us sweet looks at about 5 COMMON GALLINULES but that was it. We heard a YELLOW-HEADED BLACKBIRD but we couldn't find any at all. No rails, bitterns, or interesting waterfowl other than RUDDY DUCKS. Was expecting a little more, maybe unrealistically, but Hennepin has always been amazing in the past. As we got out of the car, we heard a calling NORTHERN BOBWHITE bobwhite call. 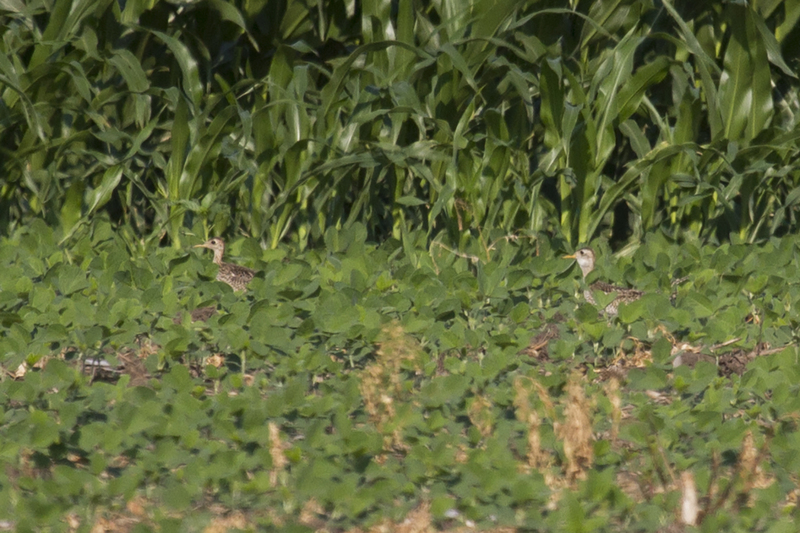 Then scanning of the field found a lone sandpiper sitting still in a dirt hole. Not a great look and pretty distant, so it was a great relief when the bird decided to fly in pretty close to us. Eventually we had 2 of them! Nice stop #2! Continuing on with Nat at the controls and me eating a lot and playing some great 80's tunes, we headed to Emiquon. Unfortunately, we didn't have the same luck that others had with some of the rarities here, and I was woefully ill-prepared for the swarms of biting flies and gnats on the South Globe trail, so that little walk was cut short. 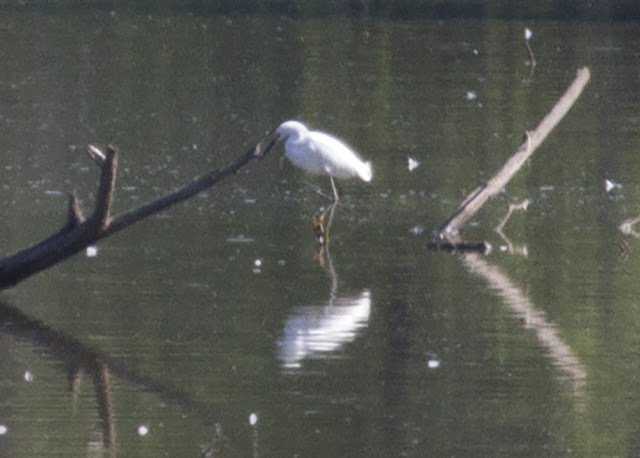 We did manage to find the SNOWY EGRET at the North Globe tract, but that was about it. 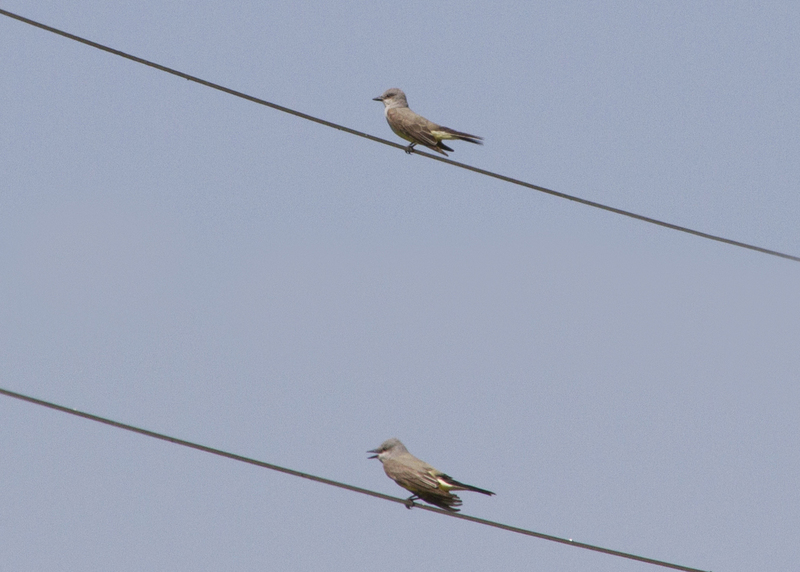 Our search for the WESTERN KINGBIRDS was equally satisfying. We had great looks at 3 kingbirds at the Havana substation. Maybe the best birds of the day we saw on a random roadside on our way out of the Havana area. I saw some white waterfowl in a grassy area which I originally thought were barnyard ducks but we pulled over to check them out and saw 5 SNOW GEESE! 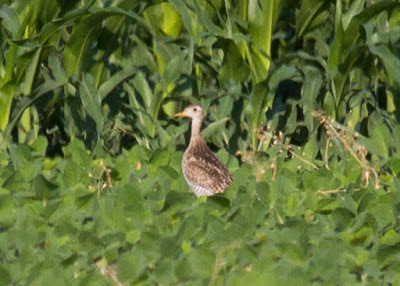 Not exactly the bird you expect to see in June. Lake Springfield was next but this was before the latest BB Whistling Duck sighting so we knew nothing of it. All we found at Lake Springfield was a lot of boats and repaving/road construction at least 1/2 the way around the lake. Not thrilled by that. 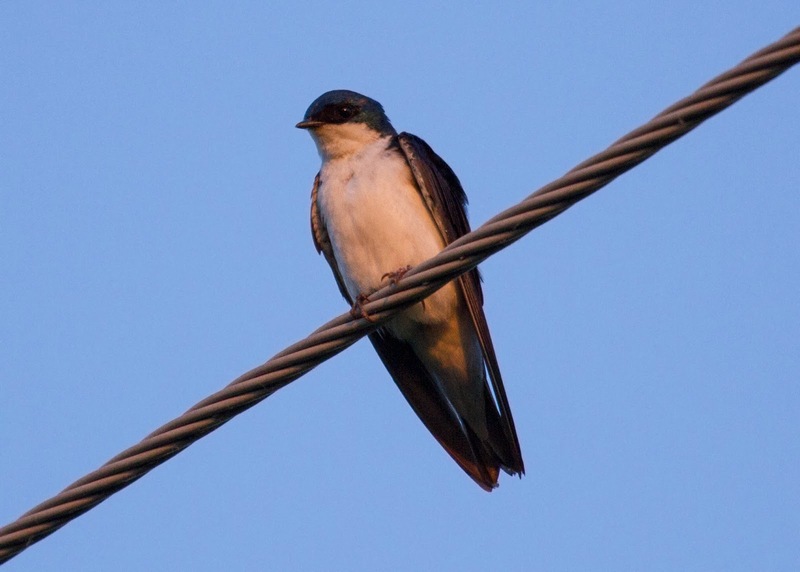 This was also the first stop where we really found out that the most common swallow in southern Illinois is CLIFF SWALLOW. We saw probably hundreds of them over the course of the weekend. By contrast, we saw 1 TREE SWALLOW. Pretty amazing. We decided to overnight at the Four-star Marion Walmart Supercenter parking lot, which was actually incredibly packed with cars and RV's at 9:00pm. It was here that we discovered the preferred habitat for COMMON NIGHTHAWKS as they called continuously through the night until early morning. We slept pretty well in the folded back front seats of Nat's luxurious Toyota Highlander, and awoke at 2:00am to begin our Southern IL Big Day at Fern Clyffe State Park. We got to the park around 2:30ish and were promptly greeted by a loudly barking dog (at 2:30am?) 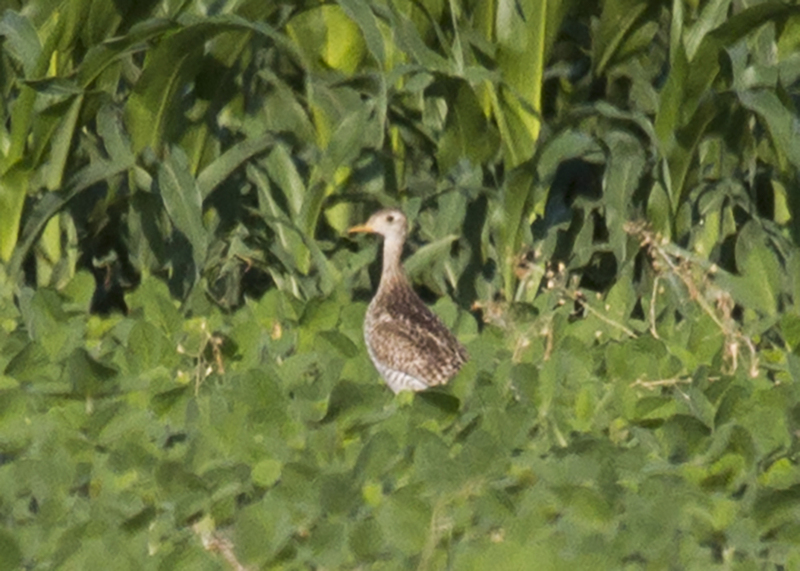 and a loudly calling CHUCK-WILLS-WIDOW about 20 ft. away from the road. We also had a WHIPPOORWILL and a calling EASTERN SCREECH OWL here. Our best best birds of the night, though, were three juvenile BARN OWLS all calling within the same area around a known nest site. 1. Mermet Lake- disappointing; got virtually none of the marsh birds I was hoping for other than a distant grunting VIRGINIA RAIL that was one of 2 dirty birds that we had. 3. BIGGEST DISAPPOINTMENT: The complete lack of waders. We scanned Little lake Rd. and saw nothing but dry fields. One fluddle had 15 GREAT EGRETS and some AMERICAN WHITE PELICANS. 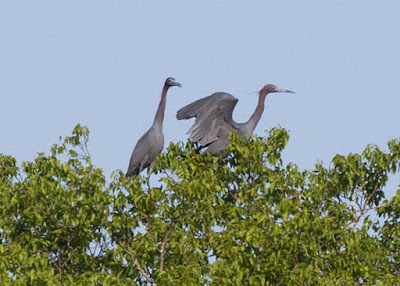 I may have given up too early in that I didn't check Neunert Rd., but everything looked SOOOO dry that I thought time would be better spent checking Monroe County...that was even drier, so LITTLE BLUE HERON was the only other wader we had on the entire day. Huge bummer. The entertainment came as we were watching the vultures. All of sudden we heard GUNFIRE! Hit the deck! So we got down and were looking around while the gunshots continued. And then we saw that we were parked in front of a gun club. Hilarious. 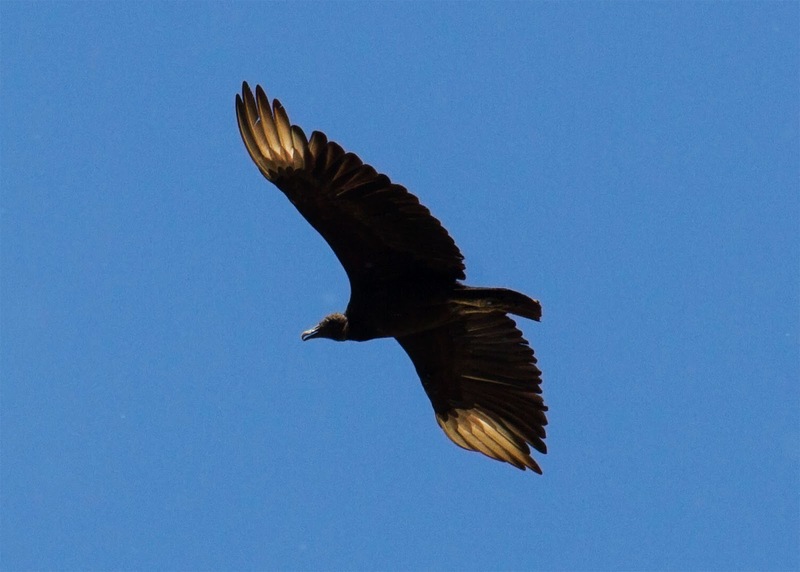 I thought that Black Vulture was gonna be our last bird of the day....and year...or life. Yikes. 4. BEST SPOT OF THE DAY: Hands down was the campground road leading up to and past the Pine Hills Campground at Pine Hills - Larue. It was loaded with singing warblers at 10:00am. Incredible. We also had a LOUISIANA WATERTHRUSH land on the road right in front of us to give us nice looks at his overall whiteness in underparts and bold eyeline. The drive gave us 5 KENTUCKY WARBLERS, 3 HOODED WARBLERS, 2 WORM-EATING WARBLERS, 3 YELLOW-THROATED WARBLERS, 2 CERULEAN WARBLERS. and our only PILEATED WOODPECKER of the day (really?!). What a great place. You have to go there if you're in SW IL. 5. 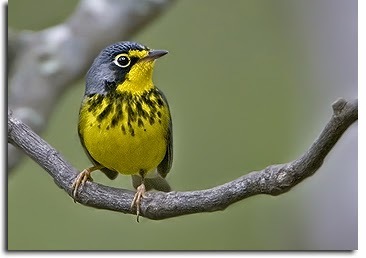 MOST VOCAL BIRDS OF THE DAY: NORTHERN PARULA and ACADIAN FLYCATCHER. 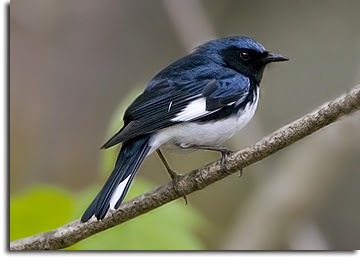 Seemingly every stop with a wooded area had multiples of these birds singing. 6. NUMBER OF FARM VEHICLES PASSED ON ROADS: 9. I just made that number up but it seemed like more. Every stretch of road had these huge farm vehicles that looked like AT-AT walkers from Star Wars. 7. BEST MISSED PHOTO OP: Driving down Bluff Rd. we had a RED-SHOULDERED HAWK grab a snake and literally fly right alongside the car as it passed us going the other way. It was too cool. 8. STRANGEST TRAFFIC SLOWDOWN AND BIG DAY OBSTACLE: These two trucks were coming off a freeway ramp with enormous, make that GARGANTUAN, cylinders that looked like they belonged on a spaceship. The trucks carrying them couldn't make the turn off the ramp without taking out the median, so they had to go backward a little, then forward, then backward......for 5 MINUTES....EACH TRUCK. Amazing. The stress caused Nat's nose to start bleeding. 9. 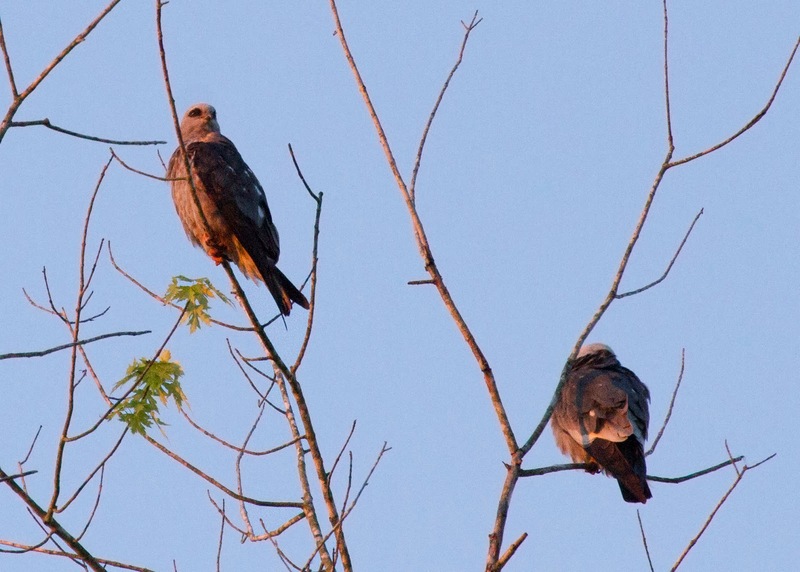 2nd BEST SPOT: The birding mecca of Front St. in East St. Louis. We finally found the PAINTED BUNTING after missing it the night before. It was pure luck that we found it, also. It wasn't singing, but as I was scanning the trees, a small bird that looked red flew from one cottonwood to another. Only problem was that it was buried in the leaves. It finally made its way to the outer leaves, though, where we were able to get a fleeting but decent look at the red belly and purple head before it flew back into the trees. Great bird! 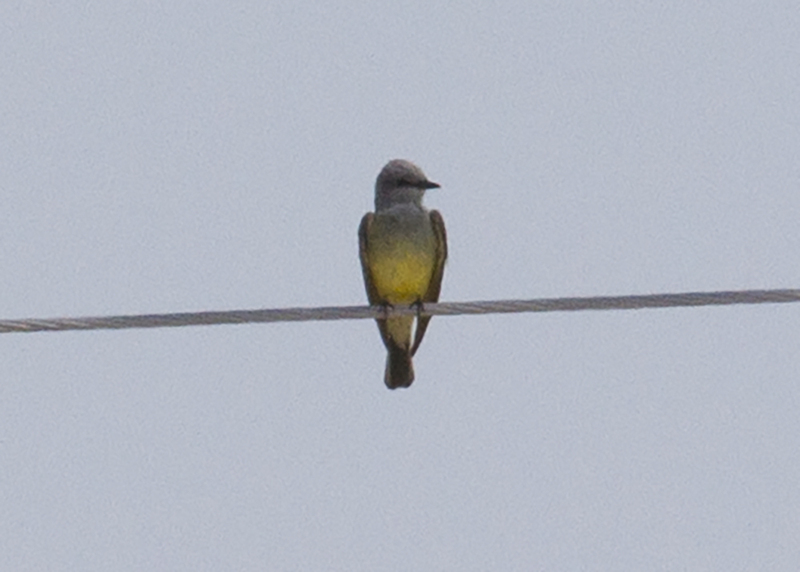 On the way out we passed by a pair of WESTERN KINGBIRDS for the 4th and 5th westerns of the trip. Definitely a record high for me for 1 year, not to mention 1 weekend. 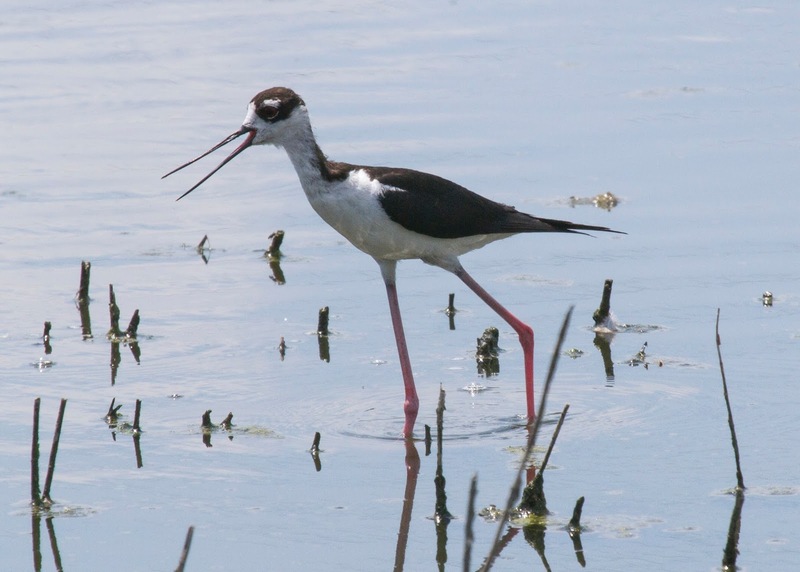 From here we went over to Monsanto Ave. for only our 2nd shorebird of the day, a BLACK-NECKED STILT. 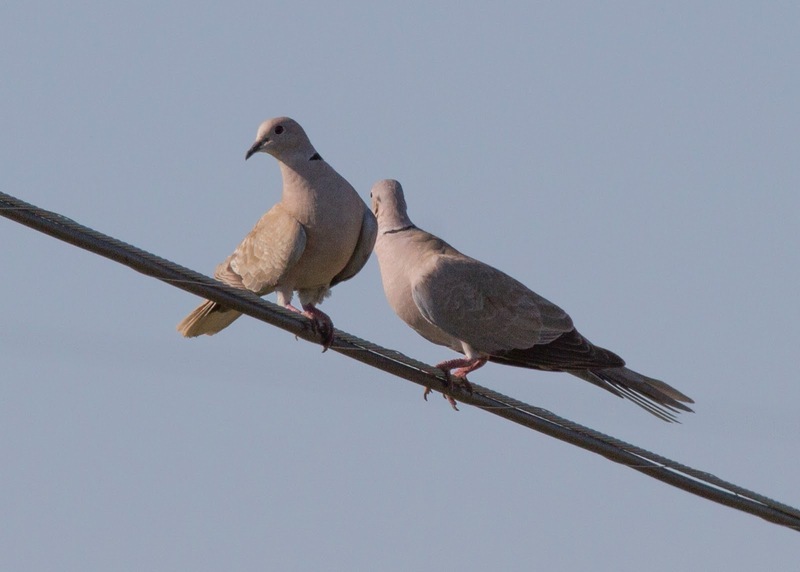 We also had our only EURASIAN COLLARED DOVES of the day in this area. 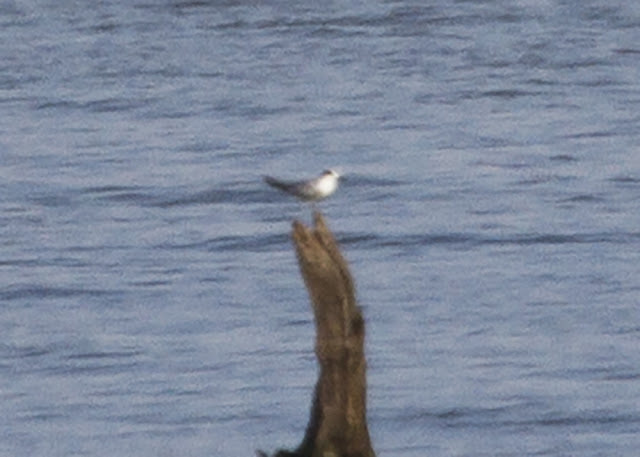 I think it looks more like COMMON TERN since the wings look longer than the tail to me and the primaries are real dark. The head looks like it's more black toward the back of the head, I think, but the chest is really white and first year Forster's can have darker primaries, so I'm leaving it as Sterna sp. 10. LAST SPOT: Jasper Co Prairie Chicken area- No prairie chickens but we did have our only HENSLOW'S SPARROWS and our only TREE SWALLOW of the day. That pretty much shot down our Bell's Vireo attempt, so we ended the day with 110 sp. after getting the COMMON NIGHTHAWKS at the Effingham Walmart where we spent a peaceful night #2. HOUSE FINCH (whatever...), HERRING GULL (never thought it would happen), GREEN HERON, EASTERN BLUEBIRD !?!?! ?, SEDGE and MARSH WREN, SWAMP SPARROW, SORA, etc. Those were just some of the notables. Need to tweak the route a bit for next time. Not too bad for a pretty new area, though. It was loads of fun with some great birds and great company. Thanks to Nat for absorbing the burden of most of the driving and for the awesome photos. As I've mentioned before, I began doing Big Days in January of 2013. There were many things about the Big Day that appealed to me. As a former college athlete, I'm pretty competitive, so trying to see more birds than other people was inherently attractive to me, and the challenges were many which made it even more appealing. Thus began the string of Lake County Big Days that brought us to yesterday, May 16, 2015. It was indeed a Big Day. Weather is always the key for Big Days during migration, or any Big Day, really, so yesterday was wrought with anticipation. There were Sw-Se winds predicted to some degree or another overnight along with possible rain. South winds combined with rain always present the chance for a fallout of sorts, so that thought was in the back of my mind as we headed out at 12:15am. Amazing how soon I forget this. One personality flaw that I'm still working on is that I'm a big baby when it comes to poor weather. My philosophy has always been if the weather is good, its a great day no matter how many birds we see. If the weather is brutal, then mental anguish sets in. This was the scenario yesterday around 4:30am. I seriously was considering calling it quits at 7:00am because I was tired of dealing with rain for 2.5 hrs....and the rain wasn't even bad. My teammates, Andy Stewart and Eric Lundquist, were especially resilient and without saying much, just continued to bird like nothing was happening, so I just followed along and tried to enjoy the birds. The rain eventually stopped and it became fairly nice for a time. As it turned out, I believe the rain did bring some birds down. It's really interesting to me how Joe Lill's team had such a different experience than we had. There must have been a short window of activity in the morning that we benefitted from and they missed. Don't know how else to explain it. So our sojourn began at 12:15 at Rollins where it was much harder than expected to get both rails. Eventually we had multiple SORAS and 2 VIRGINIA RAILS at one marshy spot along the trail. We also had many peenting WOODCOCKS (yes, they were woodcocks and not nighthawks), and at least 10 singing HENSLOW'S SPARROWS. We ended the night with all 3 expected owls, WHIPPOORWILLS, and the best bird, a COMMON GALLINULE on private property that "sang" its ascending whinny loud and clear about 50 ft. from us. We finished the nighttime hrs at Daniel Wright Woods when Eric deftly picked out a silent, staring BARRED OWL from the trees. I never would have seen that bird. Eric easily nabbed at least 4 birds on the day that I would have completely missed. Love teamwork. So as the rains began around 4:30 and we continued to try to get a response from the Barred Owl, the thrushes began singing/calling. We had a singing WOOD THRUSH almost immediately and a VEERY sounded off a little later. 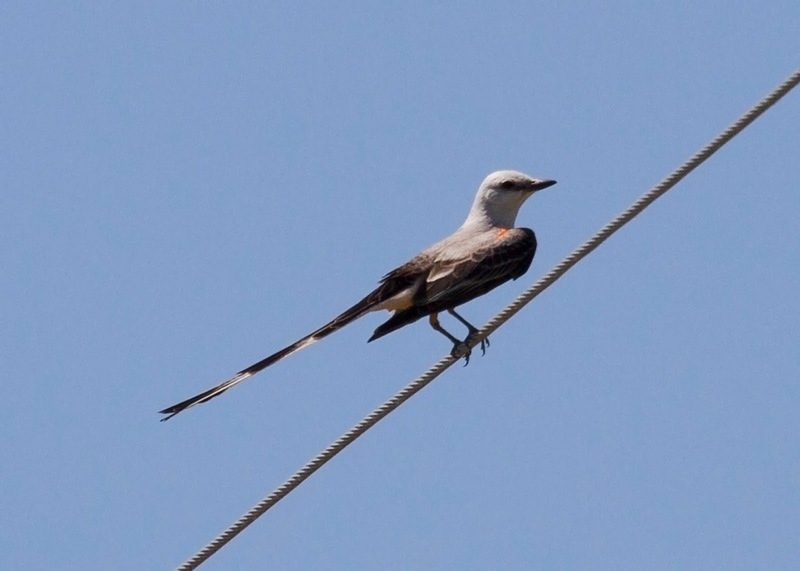 My favorite, though was the wiry song of a Gray-cheeked Thrush followed by ascending "weer" calls. We later saw a trailside SWAINSON'S THRUSH to knock off the expected thrushes. As sunrise began, it was still raining but apparently the birds didn't mind too much, though the song was definitely at a minimum. Activity was brisk, however, and with Eric and ANDY's sharp eyes and ears we were able to nab many of the easier warblers. 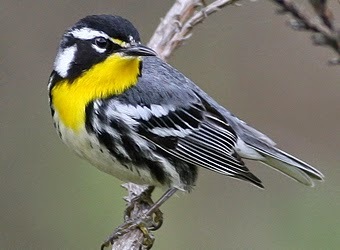 Actually the only notable warbler misses we had on the day IMO were Golden-winged, Pine, and Cape May. We also had visuals on all of them except HOODED, PROTHONOTARY (had 3 of them singing at close range), and CONNECTICUT which were heard only. The Connecticut was especially frustrating because it sang repeatedly in a shrub right in front of us but wouldn't respond at all to pishing and when I played its song, it shut up permanently. Eric was the only one to hear the Hooded, so it became 1 of our 3 dirty birds for the day. More about the warblers. The best spot was the south ravine at Ft. Sheridan. It was crawling with birds. Best were a singing BLACK-THROATED BLUE, CANADA, and a bird I'm 90% sure was a Kentucky Warbler, but I only saw it naked eye at about 20 ft. My eyes aren't great so I tried to get bins on it and it dove never to be seen again. It definitely was all yellow with a black mask and no white that I could see. The 3 of us actually commented on how many birds there were. We saw, and heard, A LOT of birds Saturday. That was the only thing that made the poor weather bearable to me. 2. 3 CANADA WARBLERS- always tough for me to see. 4. 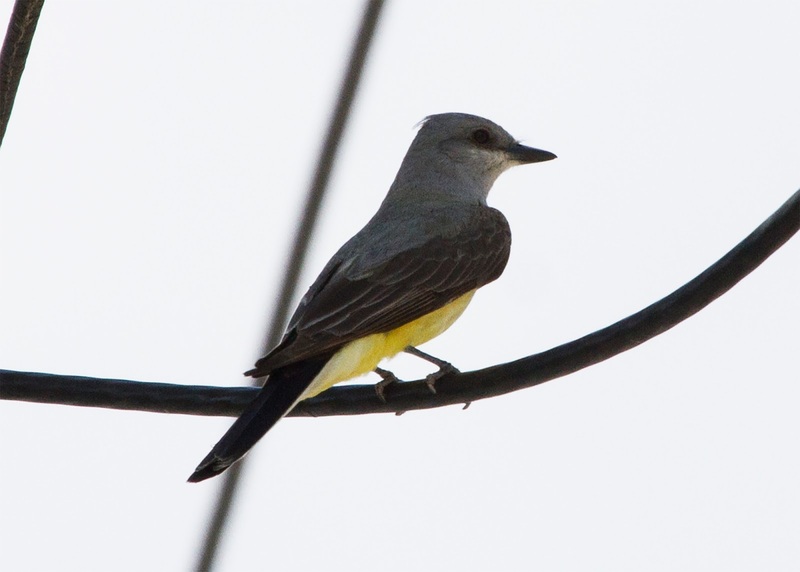 Yellow-throated- only seen 2 other years in Lake County by me. We ended the day with 27 Warbler sp. which ties a personal best for me in one day. So stage 1 for the day was the warblers. Stage 2 was the lakefront itself with associated beaches. This portion of our trip began at Waukegan and really was pretty good. Things didn't get poor until we reached the South Unit at IBSP. 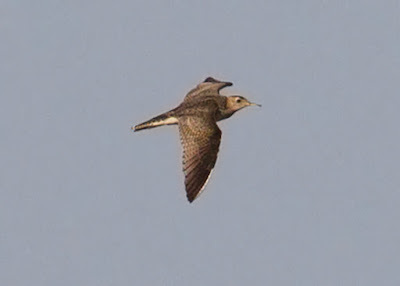 At Waukegan we had most of our shorebirds with 6 sp. at the Pershing Rd. mudflat. This is possibly the most productive shorebird spot in the county other than the beach itself. We also had the Connecticut warbler singing along this road in a shrubby clump. From here we ventured to Midwest Gen to look for the PEREGRINE FALCON. I saw nothing after looking hard and neither did Andy. As we were pulling out to leave, however, Eric snags the bird soaring and we all get on it in time to see it glide slowly in to the nest box. Very nice. Lyons was good (a BTB Warbler and 3 visual PINE SISKINS) but the greatest potential for "good stuff" was the South Unit.....and the beach was totally fogged in....and the temp had dropped about 10 degrees. No shorebirds....except a DEER-DEER-DEERing GREATER YELLOWLEGS, No RB Merganser, No Chat seen by 2 people in the past 2 days, and I was only able to hear the LARK SPARROW sing once. We did have a good amount of activity along the middle trail though including scads of flycatchers. Traill's (none here were singing, though we did add Willow later), the yellowest YELLOW-BELLIED FLYCATCHER I've ever seen, and many LEAST FLYCATCHERS. The campgrounds surrendered a gorgeous YELLOW-THROATED WARBLER and a very vocal RED-BREASTED NUTHATCH. The North Unit gave us BLUE-HEADED VIREO for all the expected vireos and 2 good ducks, 3 RING-NECKED DUCKS and 3 RUDDY DUCKS. North Point Marina was completely fogged in so no water birds here at all. We then headed west where we nabbed VESPER SPARROW, BLACK TERN, YELLOW-HEADED BLACKBIRD, AMERICAN WHITE PELICAN, WILD TURKEY, TRUMPETER SWAN, BALD EAGLE, and LESSER YELLOWLEGS. 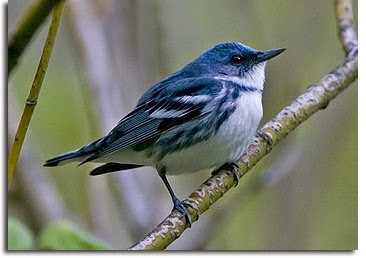 We were driving through COLSP when I heard a singing CERULEAN WARBLER. cerulean song This was in the middle of a crowded campground. We quickly pull over and 3 guys fly out of the car like the A team. The people in the campground thought they were being raided. It was pretty funny. Great bird. Had some nice looks also. We finished the day in near dark at Rollins with Gadwall and a tu-tu-tu -ing SHORT-BILLED DOWITCHER short-billed call. It was wild. Thanks again to my teammates Andy Stewart and Eric Lundquist for a lot of great birds and good laughs. We ended the day with 164 sp. which, I believe, is a new Lake County record. Pretty exciting stuff! So on Dec.7, Steve Bailey, Andy Stewart and myself tackled my 24th consecutive Lake County monthly Big Day......and it was unfortunately a very forgettable day. I had my 2nd worst total in the 24 months on Sunday (the worst was 1/26/13 by 1 bird) with 54 sp. Birds were just really difficult to find. It seemed like mid-winter except warmer. The weather was actually pretty nice which, of course, is the kiss of death for my birding adventures. The lakefront didn't have much, and we didn't hit enough feeders during the course of the day. This is a problem I need to rectify on future winter big days. This and the lack of berry bushes on our route were a couple of issues. The route definitely needs some tweaking. We started at 5:15 am at Pine Dunes and had probably our biggest highlight of the day right off the bat. In the span of 15-20 minutes we had 2 whinnying EASTERN SCREECH OWLS, 1 adult GREAT HORNED OWL, and a barking N. SAW-WHET OWL not 10 ft. from us and about head high. If only the rest of the day could have played out this nicely. We headed over to Rollins but got skunked yet again on Short-eared Owl. It started to get brighter around 6:45 so we scanned for waterfowl on Third Lake quickly and headed over to Deep Lake. The day before I had some nice waterfowl here, but today the lake was almost completely frozen, and the Canvasback that was here yesterday was reportedly shot by the hunters on the lake. We did manage to find a male RING-NECKED DUCK and 7 MUTE SWANS in with some mallards but that was it. On to the lakefront. Thought I would detour down Crawford Rd. on our way to the lake to see if we could get Steve his County turkeys. We drove past Millburn school and down to Kelly Rd. without seeing a bird. As soon as we turned the corner at Kelly Rd., however, we almost ran into a flock of 15 WILD TURKEYS meandering in the middle of the road. We could have literally reached out the window and touched them as we drove past. Unfortunately, that was about as good as the birding got for the rest of the day. The lakefront was dead. Midwest Gen, which, In January had given us a ton of good birds, had barely any birds on it with 6 LESSER SCAUP being the best birds. NPM had virtually nothing other than the regulars. No flyovers and only a couple of RUDDY DUCKS in the harbor and slip. Waukegan had a HORNED GREBE in harbor but there was nothing in the lake itself and the gate to the south end was once again locked (?!?!!). The South Unit campground pines gave us BROWN CREEPER, RED-BREASTED NUTHATCH, and PINE SISKIN, but no Fox Sparrows or yellow-rumps. Ft. Sheridan and Ryerson gave us nothing other than a HOUSE FINCH, though Red-headed Woodpeckers were found by another birder that afternoon. That proved to be a big miss for us on Sunday. There were 6 SONG SPARROWS at Ft. Sheridan and a ton of gulls at the North Unit. I was able to pick out 1 THAYER'S GULL at the North Unit but it promptly was covered up by another gull so I couldn't share it with my cohorts, so that became our only dirty bird for the day. There were also no less than 5 adult LESSER BLACK-BACKED GULLS in the bunch. Middlefork proved to be a great stop. We found a distant AMERICAN KESTREL, a noisy BELTED KINGFISHER sitting very close to the bridge, and a flyby GREAT BLUE HERON for our only individuals of those 3 species for the day. 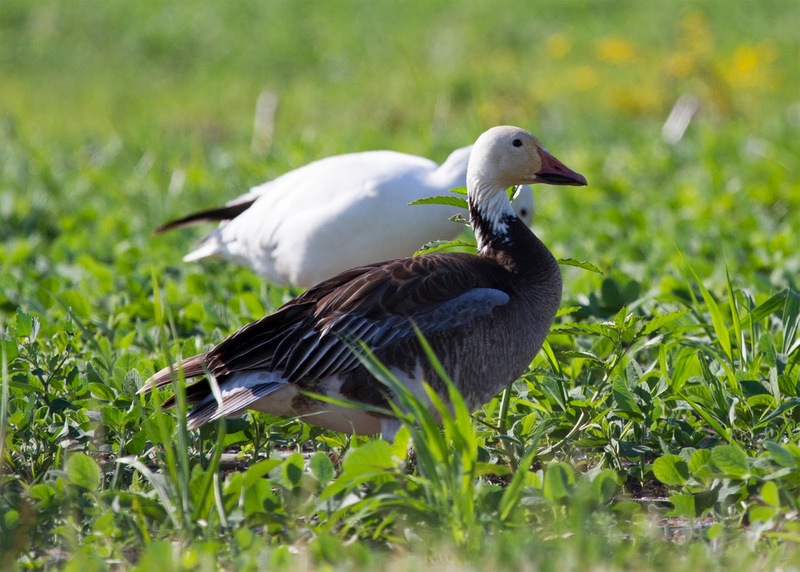 At Independence Grove we had 2 AMERICAN BLACK DUCK, but we could not pick a Cackling Goose out of the many geese at either IG or Third Lake. This was disappointing because there almost certainly was at least one of these birds in there. We finished the day at Rollins/Third Lake with misses on Short-eared Owl and Northern Harrier. At dusk we tried for rails at the north creek/marsh and had a weird eek call in response to the tape. It didn't sound quite right to me for Sora, but what else could it be? 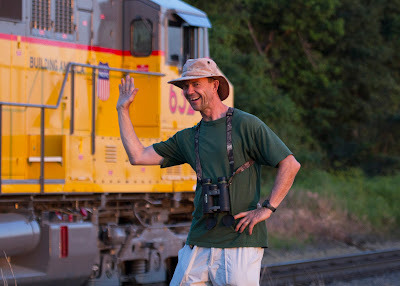 We were all thinking this until later, Eric Walters told me that Virginia Rails also squeak. I listened to that squeak, and it sounded a little more like what we heard in my opinion. In any case, we couldn't tell for sure, so it went down as rail sp. Still pretty cool, though. We finished out the day with our old friend, the BARRED OWL at Lakewood FP, who began calling as soon as Steve started his call. It took all of about 1 minute to get a response. Love that bird! So Dec. ended with very few hard-fought birds and a lot of big misses. Major misses were Cedar Waxwing (not enough berry bushes), Northern Harrier, Swamp Sparrow, Wood Duck and Canvasback that I had the day before at Deep Lake, Red-headed Woodpecker, Fox Sparrow, and Cackling Goose. 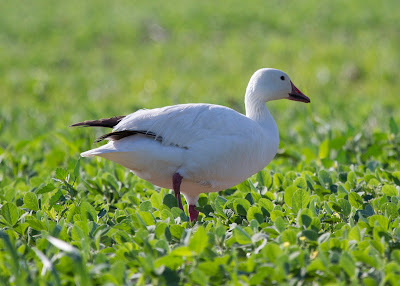 One thing about winter Big Days, they really make you appreciate the common birds. Our last daylight bird was an AMERICAN ROBIN at Third Lake, and I almost wet my pants when Andy called it out as we were driving by! Never been so happy to see an American Robin! Not sure yet what my plan for 2015 will look like but I'll let ya know. Good Birding! 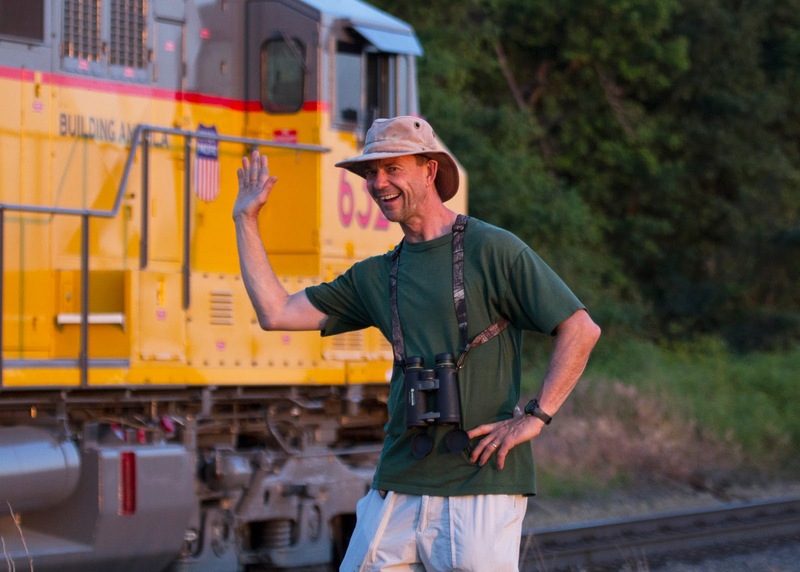 and thanks again to my awesome birding team of Andy Stewart and Steve Bailey. I spend most of my free time birding. It brings me close to nature and allows me to admire the splendor of God's creation. It's also a lot of fun to discover the rare birds.